Singer and performer Iggy Azalea was seemingly at the top and running the female rap game with the release of “Fancy,” which has currently garnered over 800 million streams on YouTube alone. But when accusations of cultural appropriation as an Australian-born Caucasian rapper were lodged at her and she fumbled in her responses, she began to generate backlash and vitriol. With the delayed release of following songs and albums and changes in her production company and management, her following releases, though many were incredibly successful and earned platinum certifications, began to lose momentum. The criticism directed at her made her fear audience reactions at times when she was to emerge and perform onstage, and she has released few songs in the past years after being virtually forced out of the rap game. “Savior” featuring fellow artist Quavo who requested to be on the track, and which snippets of were featured in her Super Bowl commercial, was meant to be her comeback. In it, she emerges in a dark room, with a halo of blue tube light, and her verses describe feeling hopeless and unheard, in need of a savior. The song has performed well, but not enough to break into the upper echelons of the Billboard Hot 100, and currently sits at 13 million views on YouTube. While the unveiling of her new projects draws closer, she remains active on her Instagram and Twitter, where she has unveiled cover art and visuals for her latest album, which she dropped on July 6. Though Azalea’s choice of genre, lyrics and response to her detractors contributed to her fall from grace, July 6 is an opportunity for her to swiftly be on the rise again and make a comeback. As a highly successful and innovative female artist in an industry that can subjugate and suffocate these voices, her returning with awareness and boldness may be just what we need. Azalea engaged with a critic who believed the images she shared online would be harmful to her children in the future to discuss how she controls depictions of herself through the female gaze. And she shared an empowering message with a fan. 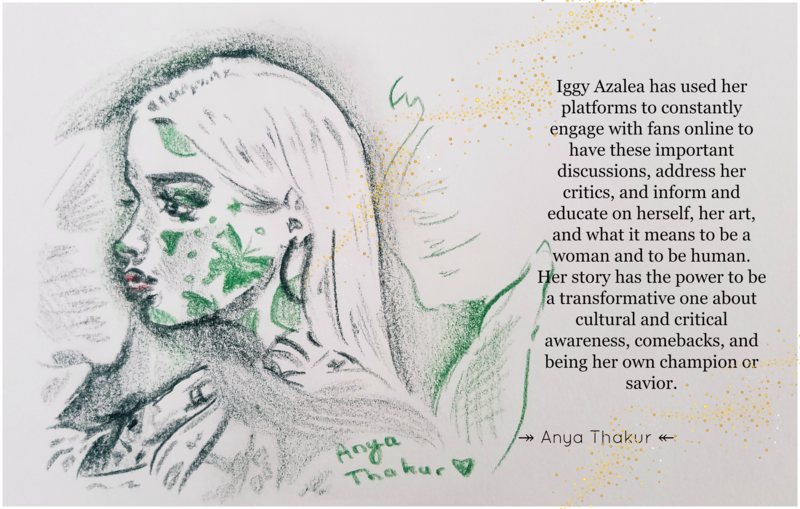 She’s used her platforms to showcase diverse portrayals of women and their bodies, express herself freely, and share empowering messages of confidence and self-acceptance. She constantly engages with fans online to have these important discussions, address her critics, and inform and educate on herself, her art, and what it means to be a woman and to be human. And she has been candid about mental health to fully share her journey and offer support to her followers. Azalea has opened up about struggles with anxiety, self-doubt, and coping with these pressures. Her story has the power to be a transformative one about cultural and critical awareness, comebacks, and being her own champion or savior. This article was written preceding the release of Azalea’s new EP and in anticipation of July 6.